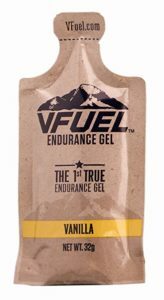 e-Gel contains twice as much complex carbs as VFuel Endurance Gel, but it also contains fructose – and that’s a good thing. 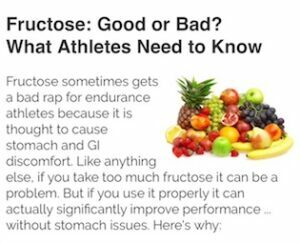 Read this article on why you want some fructose in your energy gel. Electrolytes are critical to maintain hydration and to avoid cramping and injuries. e-Gel is designed to provide complete and balanced electrolyte replacement right in the gel. VFuel contains virtually no electrolytes, thus creating a problem of how to get them. It’s well known that you need to use water (and NOT a sports drink) with energy gel to ensure that it is properly absorbed and doesn’t cause stomach issues (read article). That means with VFuel you need to take some form of electrolyte supplement (pills, capsules, salt stick, etc.). That just makes one more thing to buy, carry and figure out how much and how often to consume. It doesn’t have to be that hard (or that expensive). e-Gel is designed to give you the levels of electrolyte replacement recommended by the American College of Sports Medicine during endurance activities.